Yellow gold is the most traditional of precious metal options. It’s a popular choice for jewellery, especially engagement and wedding rings, as it appeals to those who desire its rich appearance and strength. Yellow gold for jewellery is typically made up of pure gold mixed with other white metal(s), to achieve greater durability and desired colour tone. What is yellow gold made from? Pure, 24 carat gold is not suitable for crafting into everyday jewellery as it is too soft. In order to achieve 18 carat gold, 75% pure gold (naturally yellow in colour) is blended with 25% other white metals, also known as alloys. Mixing the pure gold with white metals results in a softer, more creamy yellow than the buttery, brassy colour of 24 carat gold. World history features yellow gold jewellery from the beginning of civilisation. Who could forget the elaborate headdresses and collars worn by Egyptian Pharaohs, Roman Emperors, royalty and clergy the world over? Most recently, the bold yellow gold jewellery of the 1970s disco fever and 1980s rap music left its urban mark. The timeless style of yellow gold endures evoking images of opulence and wealth. Amongst bridal jewellery, yellow gold was once the most popular–synonymous with tradition and classic styles. The metal saw a slump in the 1990s, with many shifting to the cool, brightness of white metals. 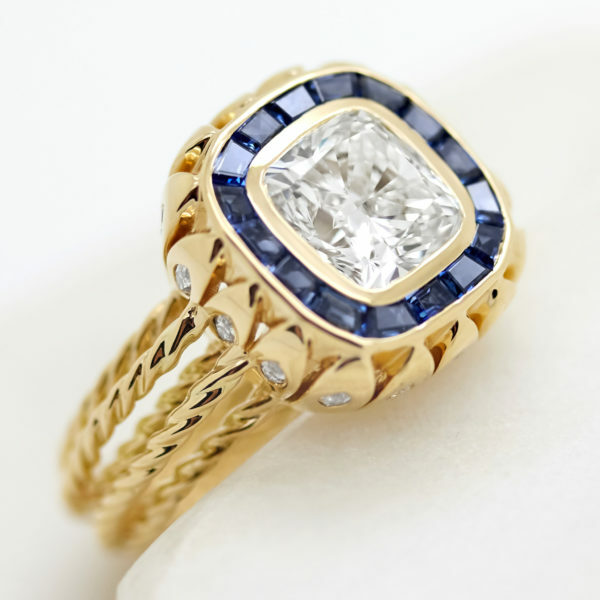 However, as with most trends, yellow gold is making a mighty return amongst engagement and wedding rings. Why should I choose a yellow gold ring? Despite seeing a slump in popularity over the last 30 years, yellow gold is no longer considered a dated trend and is making a triumphant return amongst bridal jewellery. Using yellow gold acts as a subtle nod to the concept of tradition associated with wedding and engagement rings. That’s not to say that it can’t look strikingly contemporary. 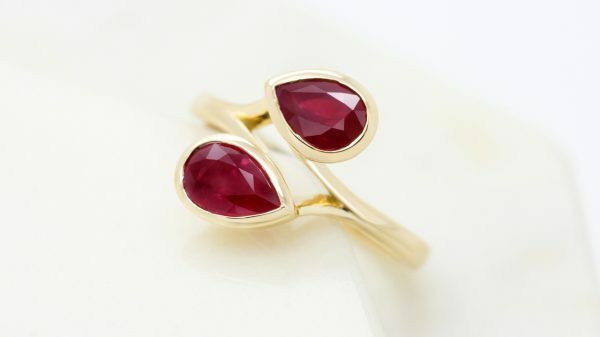 Its bold and fresh appearance works exceptionally well in both modern and vintage-inspired jewellery designs. Combining yellow gold with contemporary designs and styles is a great way to juxtapose your design. And with a marked resurgence in vintage-inspired rings in recent years, yellow gold works perfectly in designs inspired by eras gone by. Not only embedded in history and tradition, yellow gold flatters all complexions, with its rich and warm tones. How do I look after a yellow gold ring? Over time, rings may dull due to a build-up from showering, hand wash, and common cosmetics such as moisturisers, makeup or perfume. 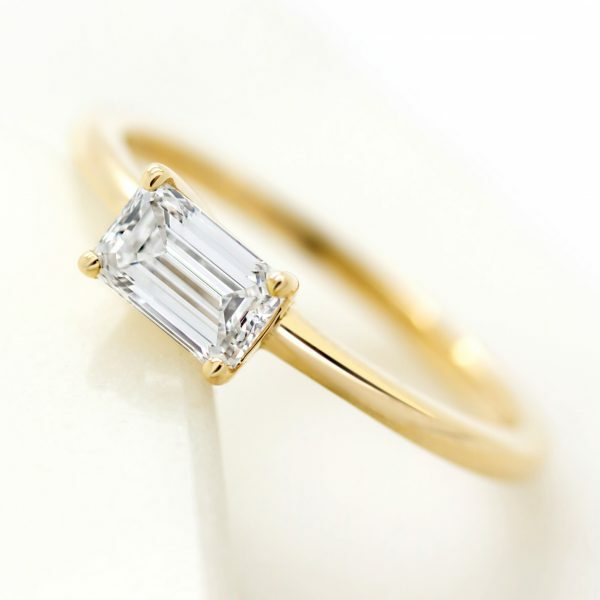 In order to clean your ring, take a soft clean toothbrush and apply a small drop of washing up liquid. Rinse your ring under warm water and gently scrub again to remove any soap residue before drying with a microfibre cloth. Ideally, clean your ring at home every month and have it professionally cleaned annually. Scratches will show on gold as a result of every day wear and tear–the scratches will be more obvious to begin with as you’ll notice them up against the newly polished surface but over time, the ring scratches will balance out to look like more of a worn finish. Deeper scratches can be repolished should you wish to have them removed.